Originally published in the September 2017 edition of South Carolina Lawyer magazine (pages 9,12). There are interesting parallels between the SC Rules of Professional Conduct and the principles of Emotional Intelligence (EI). In the November 2016 issue of this magazine, I wrote about ways our EI can be improved with resulting benefit to our practices and personal lives. This month, we continue that exploration with a specific look at EI as it relates to the rules governing the practice of law in the Palmetto State. 1] A lawyer, being a member of the legal profession, is a representative of clients, an officer of the legal system and a public citizen having special responsibility for the quality of justice. The rules assume a high view of our professional status and this expectation ought to be a strong reminder for us. Busyness with our day-to-day practices and personal lives often prevents lawyers from taking time to understand the importance of our roles. Self-awareness is a fundamental tenet of EI and is a key building block of our profession. Maintaining self-awareness is critical to our roles in the legal system and to our responsibility for the quality of justice in South Carolina. We should work to understand who we are and how we can fulfill the roles we have, in terms of these “special responsibilities for the quality of justice.” Doing so will help us take a larger view of our practices. As we each believe in our “special responsibility,” we do our part to elevate our practices and the way we are perceived by our clients, our states and the general public. The legal profession’s relative autonomy carries with it special responsibilities of self government. The profession has a responsibility to assure that its regulations are conceived in the public interest and not in furtherance of parochial or self-interested concerns of the bar. Every lawyer is responsible for observance of the Rules of Professional Conduct. A lawyer should also aid in securing their observance by other lawyers. Neglect of these responsibilities compromises the independence of the profession and the public interest which it serves. The idea of self-government mirrors another leading EI principle: self-regulation. Again, the reference is to our “special responsibilities.” Self-government in this context can refer to corporate self-government, such as our firms, and/or individual self-government. Recently, while I was leading a portion of a frm retreat and teaching about EI, an attorney mentioned the idea of corporate EI for their firm. Law firms and other organizations can definitely develop a corporate EI, either positive or negative. Have you either visited or belonged to a firm with a negative underlying ethos? Everyone walks on eggshells, no one alarms others, and no one compliments or tries to enable others. If someone does, they are looked upon unfavorably. Conversely, a firm in which people look out for one another, cheer for and help each other flourish, and celebrate victories together is a place of benefit, not only to the attorneys, but to all who are influenced by it. If we ignore these EI markers, or relegate them to the back burner, these behaviors can continue to spiral downward and become more and more difficult to reverse. Constantly referring to and studying about self-regulation is a helpful way to right the ship and move toward positive behaviors. These positive behaviors will lead to improved morale, better employee retention, greater collegiality and collaboration, and stronger client relations, all of which help law firms become a more desirable workplace and more attractive for current and future business relationships. 13] Lawyers play a vital role in the preservation of society. The fulfillment of this role requires an understanding by lawyers of their relationship to our legal system. The Rules of Professional Conduct, when properly applied, serve to define that relationship. When was the last time we thought about our roles as lawyers in terms of the preservation of society? This can feel like a daunting assignment, but is actually consistent with another EI principle—social awareness. Do we raise our level of conduct so that justice actually prevails? Do we live and work in the most ethical ways possible? Do we check ourselves regularly, in terms of our personal and professional conduct, making sure we always line up with the best things in our profession? Henry L. Deneen is Of Counsel at Murphy & Grantland. 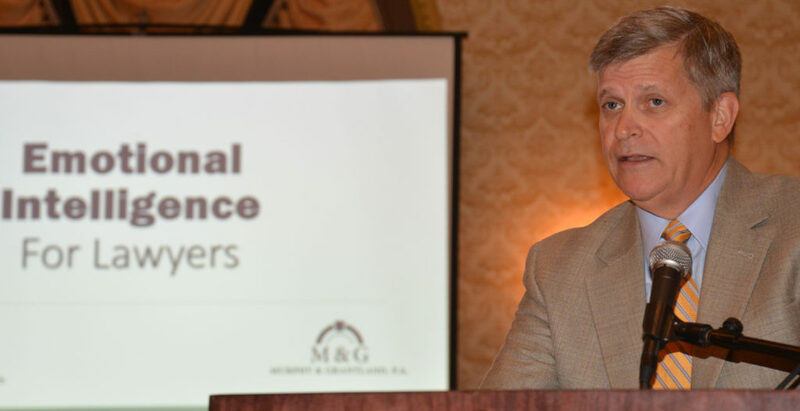 A former municipal judge who also served as Chief Legal Counsel for South Carolina Governor David M. Beasley, his private practice is now focused on defending businesses. Deneen is a certified mediation who regularly settles legal matters through alternative dispute resolution.